Toby Whitehouse two-part story for DOCTOR WHO Series 9 | Warped Factor - Words in the Key of Geek. 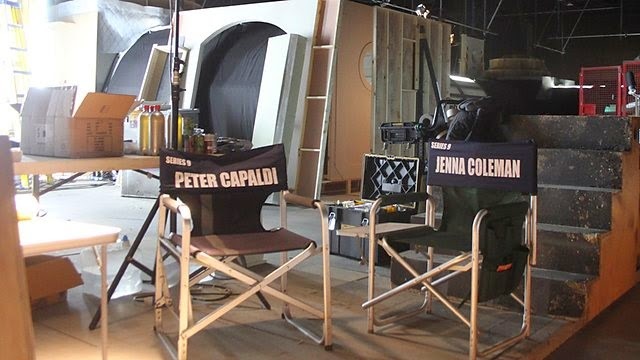 Filming has begun in Cardiff for series 9 of Doctor Who and includes a star-studded guest cast. The new series will be back on BBC One in Autumn 2015. The episodes currently being filmed are written by Toby Whithouse (The Game, Being Human), produced by Derek Ritchie and directed by Daniel O’Hara (Silent Witness 2015, The Game, Being Human). Paul Kaye who played Thoros of Myr in the third series of Game of Thrones joins the Doctor Who cast for the two-part episode. A comedian and actor, Paul is also well-known for being the voice of Vincent the fox on the puppet-based BBC comedy Mongrels. Commenting on his role, Paul Kaye, said, “As a kid of the 1970s, the two shows you always watched were Top of the Pops and Doctor Who, they were unmissable. I actually wrote a song called ‘Looking for Davros’ in my first punk band and I sang it like a demented Dalek. I got to present TOTP back in the mid ‘90’s and landing this role in Doctor Who completes the dream double. Also starring in the episodes will be Morven Christie who recently played the role of Amanda in the crime drama Grantchester and featured in Death in Paradise (2014) and Twenty Twelve. Arsher Ali who played the part of Malik Suri in the critically acclaimed The Missing (BBC One) takes up a role in the guest cast alongside Colin McFarlane who appeared in EastEnders as part of the Who Killed Lucy Beale? storyline. Recognised for her theatre and TV performances, actress Sophie Stone appears in the show for the first time. Sophie was the lead actress in the play Woman of Flowers and has appeared in Midsummer Murders and Casualty. Also joining Peter Capaldi (the Doctor) and Jenna Coleman (Clara Oswald) and confirmed for roles in the double episode are Zaqi Ismail, Steven Robertson and Neil Fingleton. Further guest cast for series 9 will be released over the coming months. Doctor Who is a BBC Cymru Wales production for BBC One.